A harrowing article in the New York Times this weekend has set plenty of people on edge. It details the rise of a fungal disease in hospitals that—like so many infections—has steadily become resistant to the drugs used to treat it. But for all our justified fears about superbugs, there’s a simple precaution against infections that most of us fail to take: washing our hands correctly. In 2013, researchers at Michigan State University carried out a thankless, if mildly creepy, study. They observed how more than 3,500 residents of their college town used the sink at various restrooms after they carried out their business. Some 10 percent of people observed chose not to wash their hands at all, which is simply not an acceptable way to end a trip to the bathroom. 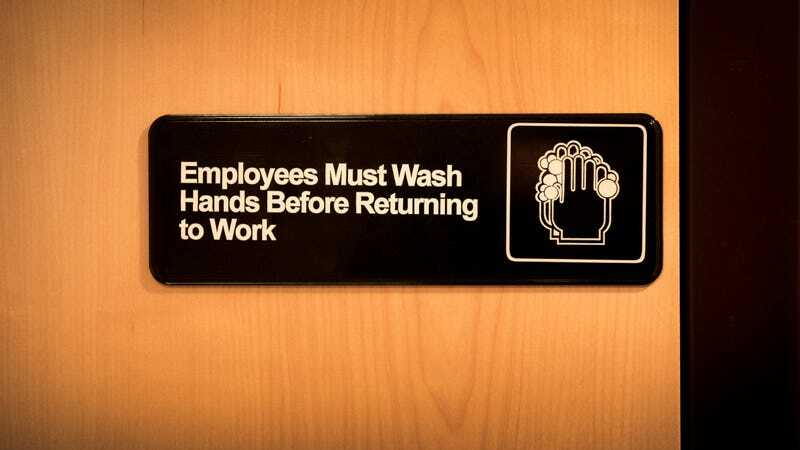 But even the vast majority of people who tried to wash their hands managed to totally flub the proper routine. Almost a quarter of people washed their hands without soap, for instance. And only 5 percent washed their hands for at least 15 seconds or longer, which is actually lower than the 20-second minimum of handwashing recommended by the Centers for Disease Control and Prevention. The 2013 study was hardly the first to showcase our horrible handwashing prowess, and it hasn’t been the last. In 2018, a smaller study of nearly 400 people, funded by the United States Department of Agriculture, found that 97 percent failed to wash their hands the right way (a whopping third didn’t wash at all) while preparing a meal. That’s especially disheartening, because foodborne germs like Escherichia coli or Salmonella are also becoming drug-resistant. Of course, handwashing alone isn’t going to stop the ongoing superbug plague. The fungal menace at the heart of the New York Times story, called Candida auris, is a hardy germ that’s incredibly hard to root out from the hospital rooms, nursing homes, and patients it colonizes. And there’s little research on whether proper handwashing can even really lower the risk of C. auris spreading during an outbreak. Leaving that aside, there are so many factors outside of handwashing that directly impact the growth of drug-resistant infections. These factors include the overprescription of antibiotics for people who don’t need them; the flooding of our livestock with antibiotics (a practice that has only recently reduced in the U.S.); and the overuse of fungicides on crops that likely cleared the way for more resistant fungi, including C. auris, to show up. But hospitals and places like it are hotbeds for lots of drug-resistant infections that can be prevented or better contained with good handwashing. In hospitals and even nursing homes where staff, patients, and visitors become better handwashers, for example, the rates of superbug outbreaks do seem to go down. Right now, these outbreaks are still largely contained to suitable breeding grounds like hospitals and prisons, and the most common victims tend to be people whose immune systems are already compromised. But they’re not some abstract danger either. Annually, drug-resistant germs infect around 2 million Americans and kill more than 20,000 directly. And according to at least one estimate from the UK, they might very well claim more lives worldwide than cancer by 2050 if no major advance comes down the pipeline (and those chances aren’t looking good). In the face of that pending doom, the least we could do is wash our hands a little better. So here’s how to do it. According to the CDC, you should wash up with soap and clean running water (warm or cold, it doesn’t really matter) for 20 seconds, lathering vigorously in between every nook and cranny. Then rinse them out thoroughly before drying fully with a towel or air dryer (air dryers, it should be said, may actually spread some of the germs left behind on our hands). Hands should be washed before, during, and after preparing food (including your pet’s meals! They often contain meat, which could be contaminated); before eating; and after every instance of handling bodily fluids (your own or others) and garbage. Alcohol-based hand sanitizers can do in a pinch, but they don’t protect you from as many germs as soap and water and aren’t as effective if your hands are visibly dirty or greasy. And not to freak you out further, but there’s also some suspicion that some bacteria are learning to fend off alcohol-based products, too.